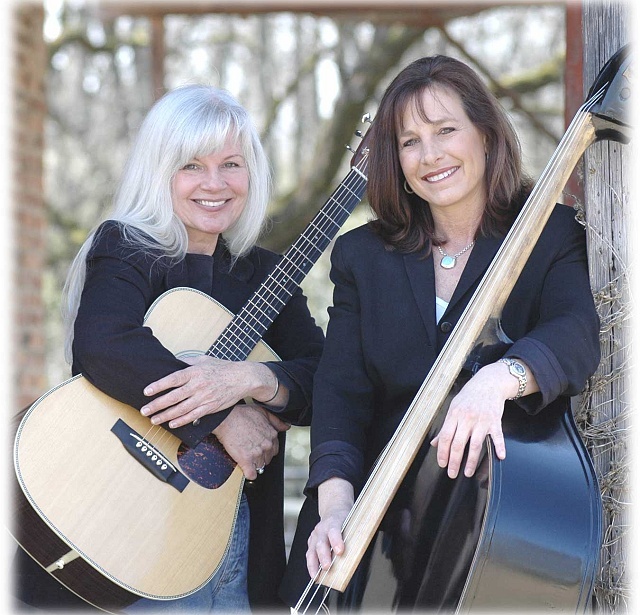 Folkslingers is a home-based publishing company with an online tune resource for women who are interested in learning American Folk Music. Our main objective is to teach traditional folk and Gospel songs to girls and women of any age who play the guitar or would like to learn to play. 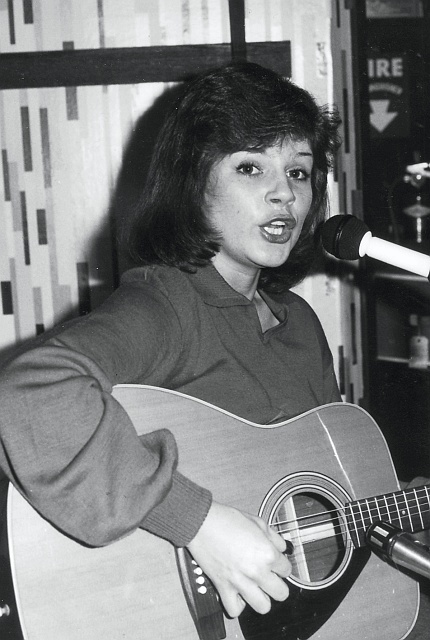 We hope to share history’s most beloved tunes with female students of acoustic music everywhere. Lifelong musician and author Susie Coleman created a series of songbooks for women and girls called Fabulous Folksongs Every Girl Should Know as a teaching aid. Each book contains 40 Public Domain songs set in women’s singing keys with lyrics and uncomplicated arrangements for the acoustic guitar, and is available in either digital or hard copy format. Anyone who purchases a book can access individual song profiles with melody demonstration videos for all songs at no extra charge (we beg your patience as we are currently in the process of creating and uploading new videos). Women seem to be highly attracted to folk music. Maybe it’s the softer tone of the guitars, the organic sway of the rhythm, or the sing-along that gets us where we live. Whatever engages us, some of us girls have a sixth sense about folk-style music and an uncanny ability to remember a lot of songs. Many of us love to perform or to be part of a performance in small way. It gives our lives a satisfaction like no other. 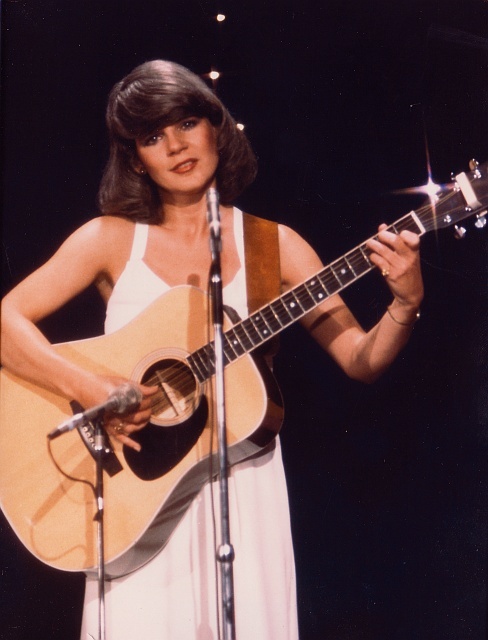 Women singers, however, often encounter difficulties finding common songs written in a key appropriate for their voice when they’re called on to sing a tune. Traditional songbooks are full of great music written in men’s keys but moving from one key to another without a serious pre-game huddle is sometimes disastrous if you’re depending on other players to lead the song. A better way is to learn to lead your own songs on the acoustic guitar with confidence in the right key for your voice. Let others follow you. You’ll love singing even more if you can accompany yourself. Susie offers beginner guitar lessons for the new acoustic guitar player in her home, at camps and classes around the mid-South, and via Skype… but if you already know a few chords, you ought to be able to play along right away using the detailed song profiles offered in each Fabulous Folksongs Every Girl Should Know volume. We have some sample song profiles you can see to get an idea of what we mean by ‘demonstration video”. When you buy one of our products, you’ll become a member of Folkslingers. Once you register a user name and password, you’ll gain access to our demonstration video library so you can sing along to learn the melodies to the songs in the books. You’ll even be able to bookmark any song titles that interest you and return later to study them in depth. Playing with other musicians is way more fun than playing alone. Other musicians help us carry the tempo so you can concentrate more on singing. To this end, we have included “number charts” with many of our songs, space permitting, particularly for the tunes that are more likely to require the use of a capo. More advanced musicians will probably have some concept of the Nashville Number System and can catch on faster using our numbers charts to keep up with a song’s arrangement. 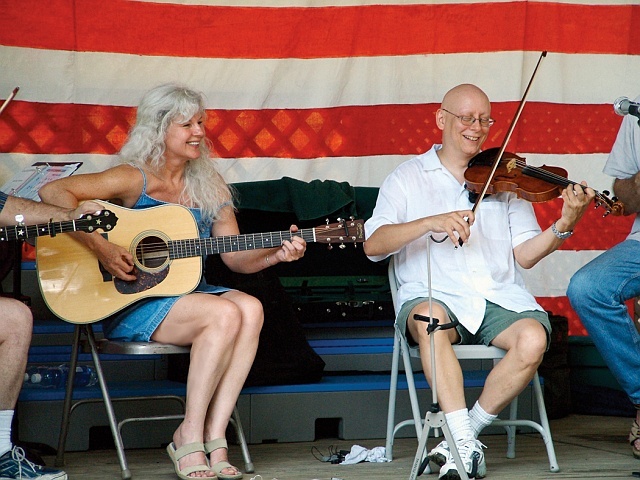 We encourage you to create opportunities to jam with other musicians who like folk-style music. 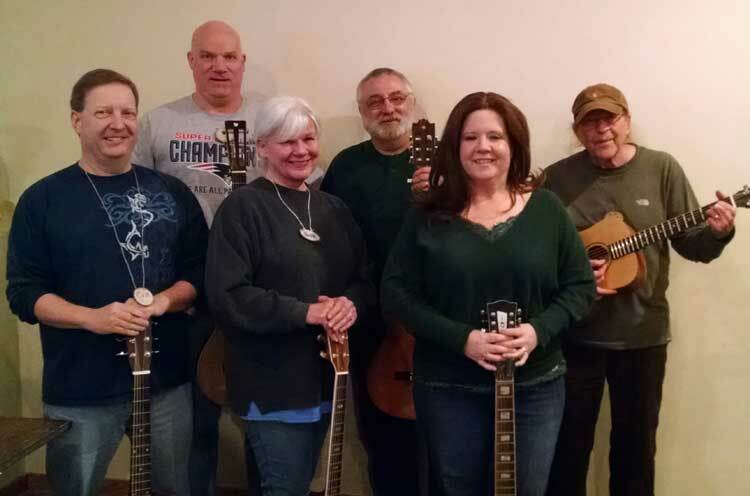 Besides playing a few of the wonderful old tunes you’ll find on this website, jamming gives you the chance to hear meet other pickers, hear some new music, and practice playing the rhythm guitar while others are singing. 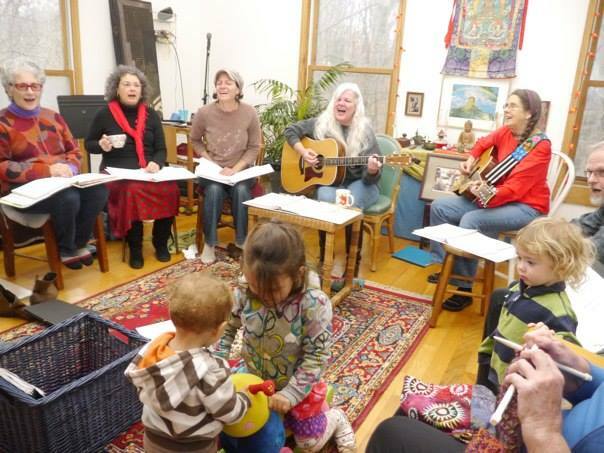 Find a church, school or club that will allow you to hold a jam and watch other folksingers like yourself come running. Bring your books and take turns choosing songs. My childhood was typical of many musicians, I suppose; you could often find singing around the kitchen table in three part harmony. Born in 1951, I was raised in Northern Ohio in a tiny historical town called Tallmadge about 40 miles south of Cleveland. My father, Wayne Coleman, was an appliance salesman at Sears & Roebuck in Akron. He could also play the accordion. We were the neighborhood Oom-Pah Gang — Daddy would haul out that big keyboard and we’d polka all over the backyard. I’d grab my sister and we’d ‘Roll Out the Barrel’ til we fell down dizzy. I’ve loved music ever since. The other side of the family hailed from Cumberland County in East Tennessee. My grandma, Rintha “Addie” Hale, and grandpa, Ralph Smith, had moved to the Akron area during the Depression to look for work in the rubber factories. Both were devoted members of their church and sang in a Gospel quartet — and yes, my granddaddy sang bass. 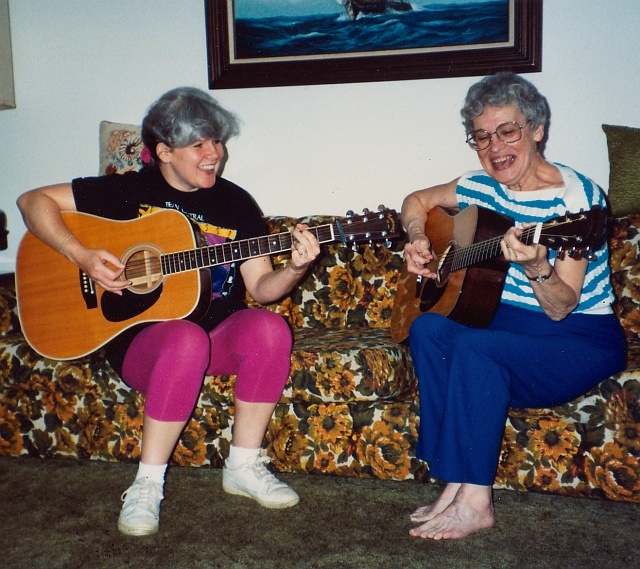 From the time they were young, my mother, Opal Smith (Coleman), and her sisters Virginia (Good) and Shirley Mae (Hubbard Frey) played guitars and sang what they simply called “hillbilly music” along with old gospel numbers they learned from my grandparents. Even as a small child, I loved the feel of these old songs and easily memorized the melodies, harmonies and lyrics. Now that I’ve been around skilled musicians as an adult, I realize what incredible harmony singers we had in the family. I give them full credit for whatever good ear I may have. I jumped headfirst into my mother’s old Silvertone when I was ten. A Beatles songbook and a transistor radio became my best friends. I soaked up the music of Joan Baez, Peter, Paul & Mary, Simon & Garfunkle, Ian & Sylvia, John Denver, The Mamas & Papas, and Gordon Lightfoot, just as the Folk era began to wane in the late-60s. 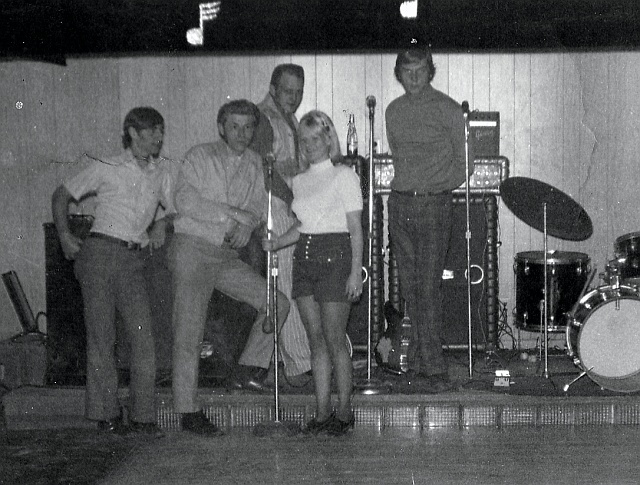 In 1969, at 18, my attention was drawn to current popular music and I got my first job performing in a local nightspot singing Top 40 hits. 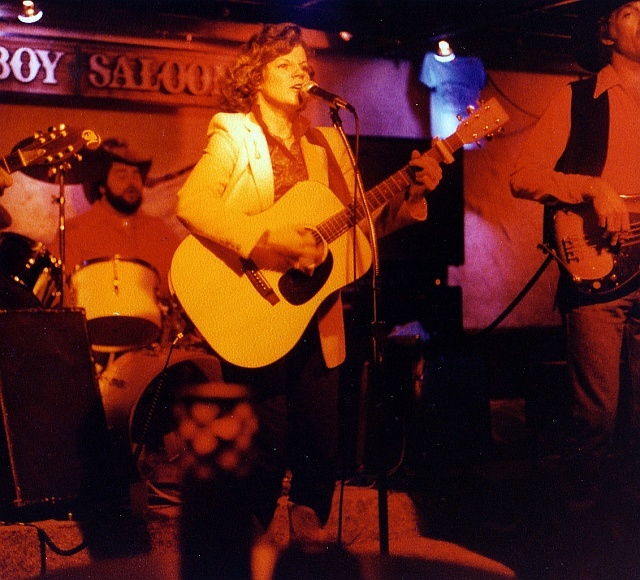 A dozen years of working in clubs followed — rock, disco, pop, swing, each type of music seemed to give added strength and adaptability to my voice. 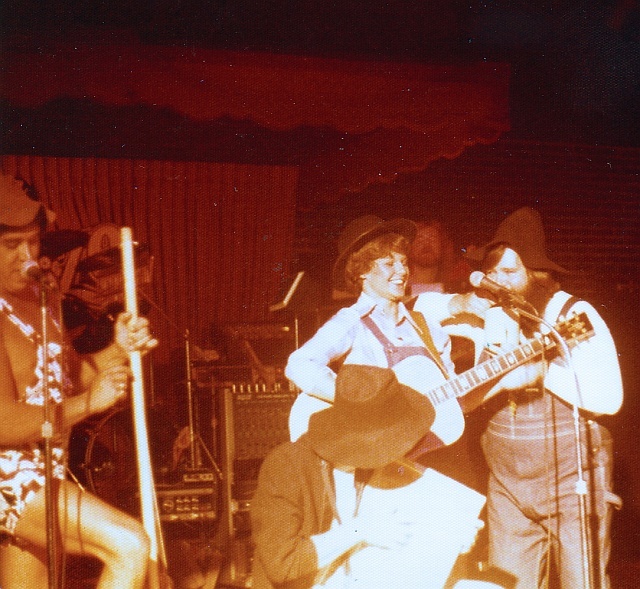 I moved around a lot, to Kentucky and Florida, playing in clubs and lounges, as a single act and with small combos. 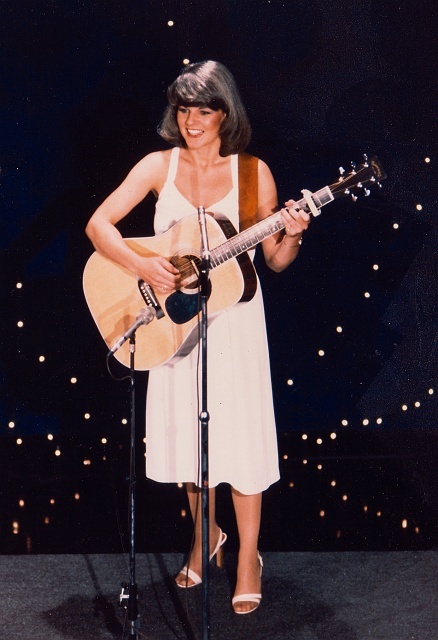 I would study and learn different styles of music to keep working — I even sang awhile for ballroom dancers with a little combo in Lexington — but at parties, I’d bring out my guitar and render some old folk tunes, and everybody sang along. I found those moments much more rewarding than the spotlight. 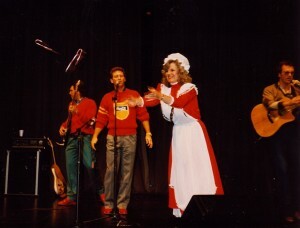 A holiday show with the Gatlin Brothers at Vanderbilt’s Langford Auditorium, 1986. 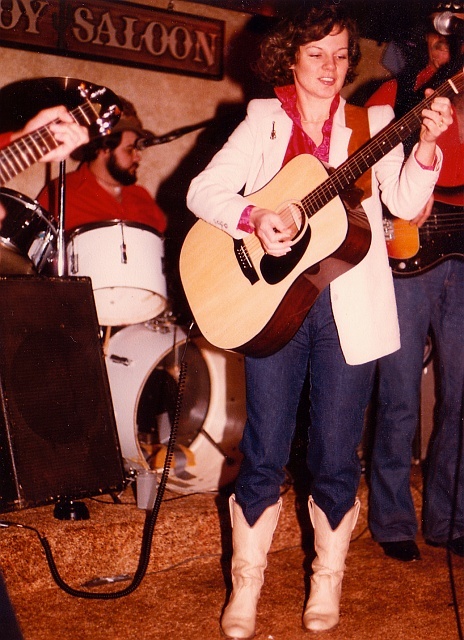 A romance with Country Music brought me to Nashville in 1978. 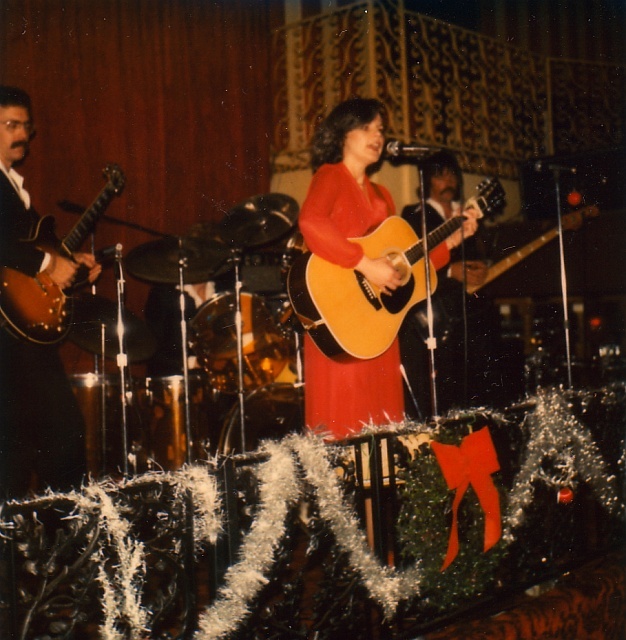 Here I played more clubs, including World Famous Printers Alley, had the honor of sharing the stage with Merle Haggard, Marty Robbins, the Gatlin Brothers and other headliners, recorded songwriter demos, and made occasional TV and radio appearances. I started to get a feel for what being a professional in the music industry was about. It involved a total commitment to living on the road, having excellent diplomacy and people-handling chops, and access to plenty of money. None of which I had. About that time, I began to notice that the music was changing, too. Country Music began to replace its organic rhythms with electric styling, and the acoustic stuff began to sit on the sidelines. I had years before established that Rock was just not for me and it was definitely not what I came to Nashville to do. I tried to adapt, but I didn’t care much for the “new” sound of Country. I longed for fiddles and banjos. A summer-long bus tour as a sideman in 1983 finally cured me altogether of longing for the big time. As much as I loved singing my heart out, the reality of living in such cramped quarters really got to me. Even though I liked the folks I was traveling with, I never felt so anxious in my life. Days seemed to have no end, and the endless waiting around drove me crazy. I have a mild case of Attention Deficit Hyperactivity Disorder (ADHD) so it was next to impossible for me to be calm under these circumstances. My gut told me there was no way I could emotionally survive out there. It wasn’t long before I decided to lay down my microphone. Fortunately, I had gained enough office experience between singing jobs to create a humble but useful skill set. In 1984, I was asked to join the Nashville Sales & Marketing Executives Association as their executive assistant and later executive director, where I remained for 14 years; it was here I starting using a word processor and began to produce desktop published newsletters and do digital design. I subsequently worked as office manager/art director for a small advertising agency; during that time, I attended Nashville State Community College to learn HTML and web design. That position ended at the start of the recession and I became self-employed. However, though I thought I was finished with music in 1984, apparently music was not finished with me. I found the “amateur” scene in Nashville — a community of pickers who play just for the fun of it — to be much more my style than the professional scene. Jack Horner and I in 2003. Photo by the one and only Dan Loftin. 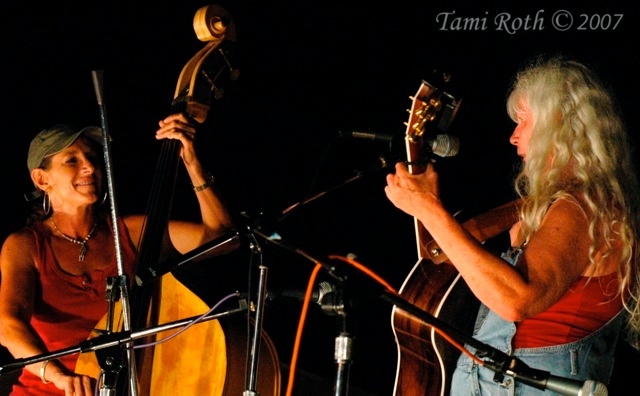 In the mid-90’s I befriended Jack Horner, lead singer with The Road to Ruin Ramblers, a local, long-standing traditional Bluegrass band well known in the Nashville area. Our voices blended beautifully — and he also played with a folksy style. 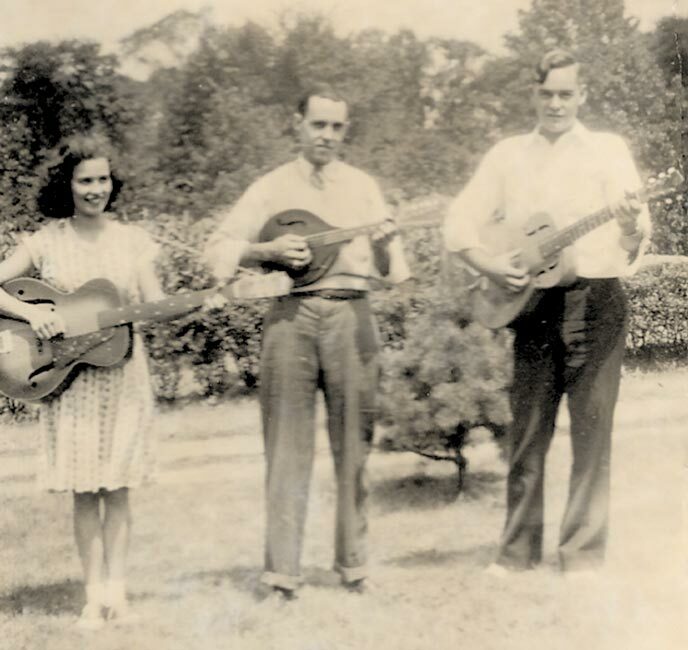 I accepted an invitation to join the group, drawn by a sense of connection as I realized that in the Bluegrass framework, I could perform some of those great old tunes my mother sang when I was a little girl. 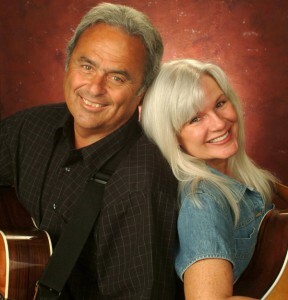 It’s been a great friendship and Jack and I have enjoyed many years of jamming and performing together. And I fell in love with Bluegrass, particularly the fiddle tunes. Jack invited me to my first old time singing contest in 1996 at the Smithville Fiddlers Jamboree in Smithville, Tennessee. 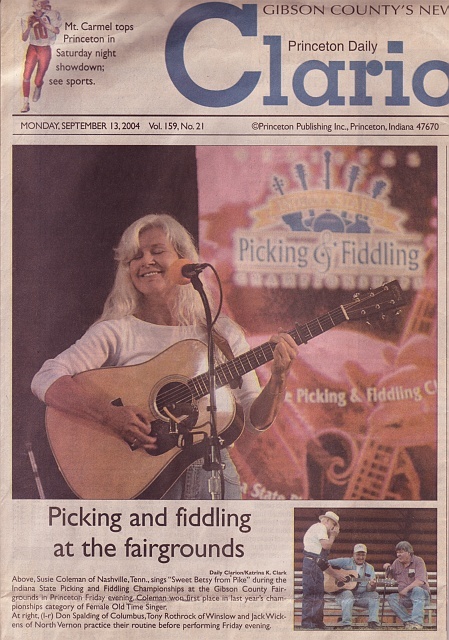 I enjoyed competing, loved the festival atmosphere, and began to enter a couple contests each year just for fun. I’ve been pretty lucky. 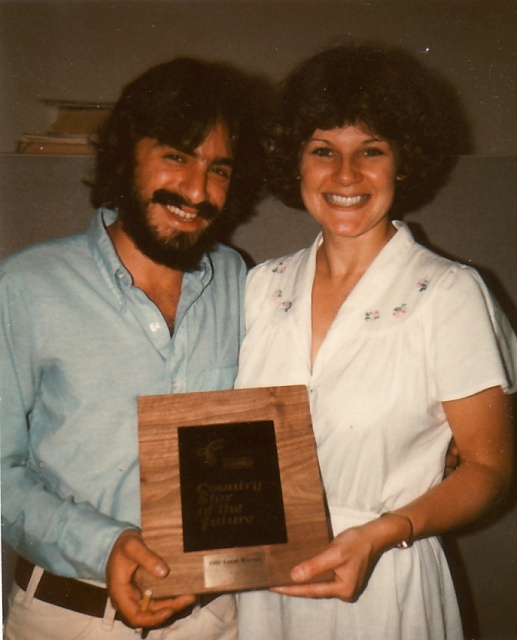 To date, my winning contest repertoire has included O The Wind and The Rain, Sweet Betsy From Pike, Black Jack Davy, Darcy Farrow, Little Rosewood Casket, Shady Grove, Pretty Saro, Give My Love to Nellie Jack, The Storms Are On The Ocean, and maybe a couple other goodies I can’t remember. I don’t compete much anymore, just every few years or so. These days I work from home as a web and graphic designer — and a music teacher, of course. I teach beginner rhythm guitar by ear, Old Time beginner alternating bass for guitar, how to understand the Nashville Number System as it applies to chord movements, and have developed a course on how to warm up your voice efficiently and effectively. I give lessons in my home or over Skype; sign up online for a series of six beginner lessons. 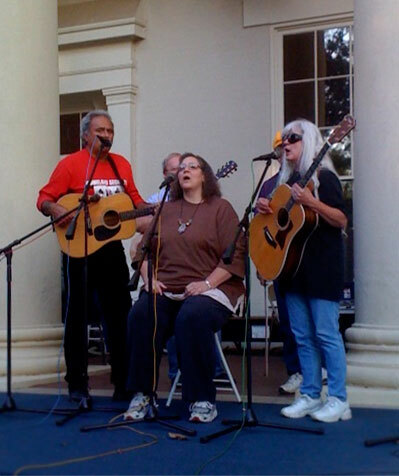 I also teach once or twice a year at the Alabama Folk School located in Nauvoo, Alabama. And every now and then, I’m honored to serve as a judge at local old timey music competitions, such as the contest in Lafayette, Tennessee (“Hillbilly Days” and the annual Tennessee Valley Fiddlers Convention in Athens, Alabama. My song list is now made up mostly of old songs but I sing a few modern tunes that just sound old. I don’t specifically sing in an Old Timey style; I believe a contemporary expression breathes new life to the oldies but goodies. 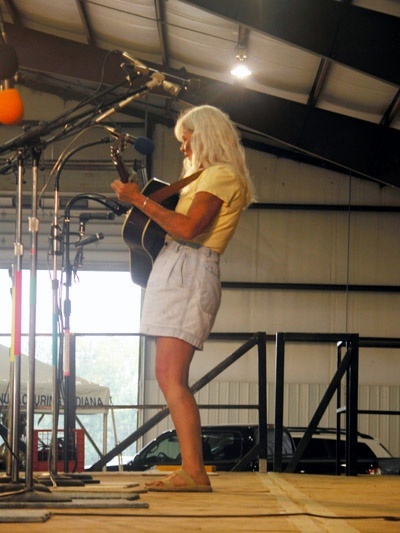 For shows and house concerts, I like to weave together songs from the Appalachians, folk songs I heard in the 1960s and 70s, and a little traditional Gospel. People have been singing variations of some of these songs for hundreds of years. I just marvel at how long these melodies have been carrying their stories. It’s absolutely my favorite music in the world. 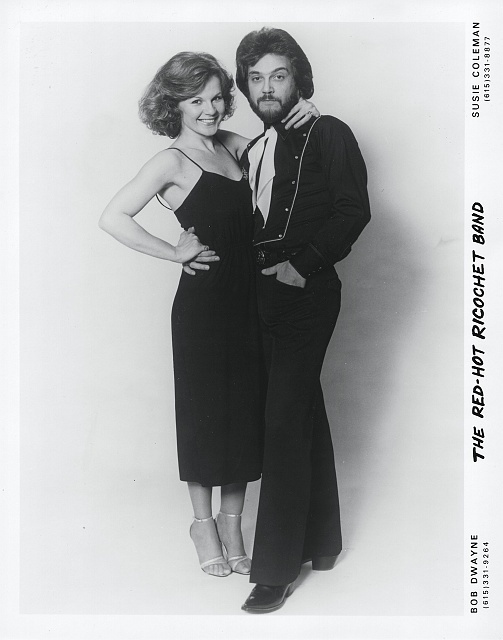 I rarely perform anymore but when I do, it’s usually with bassist Tami Roth in The Saggy Bottom Girls, or with my favorite duet partner Jack Horner. I’m also a member of the Rude Dogs Blewgrass Band (don’t ask, you really don’t want to know) and the Small Time String Band, a mostly instrumental Old Time ensemble that currently features Kirk Pickering on fiddle and mandolin, Ron Ault on fiddle, mandolin, and clawhammer hanjo, and Alan O’Bryant (Grammy-winning singer and banjo player with the Nashville Bluegrass Band) on mandolin and banjo. 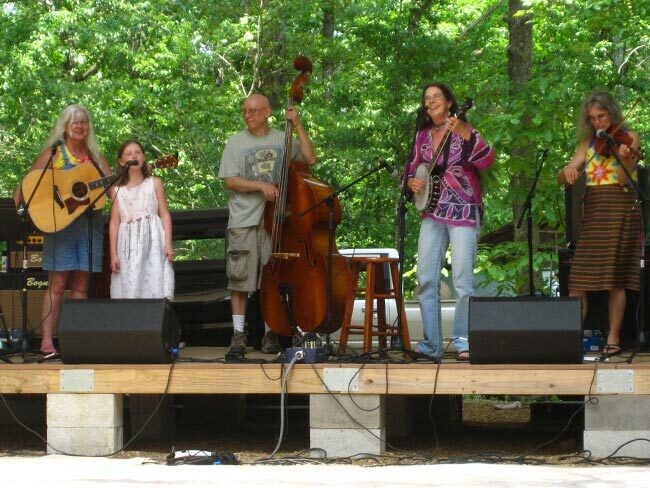 I’ve appeared at various events at The Farm in Summertown, Tennessee, several times over the last few years with friend Marilyn Harris in a little group we call Folksisters, plus I lead quarterly singalongs there. And Kirk and I often play with our favorite songwriter Michael Laidley. I also appear in harmonies and a duet on a really cool tribute album produced by Tim May in 2007, The Bluegrass Tribute to Neil Young. None of the players are listed online, but credits are in the CD liner notes; I’m there on 8 of the 12 cuts. I started teaching in 1999 at the encouragement of friends. Over the years, using my desktop publishing skills, I developed my own lyric sheets to document simple yet memorable songs for newbie guitar players. One day I realized I had more than enough of these song profiles for a book so I assembled them into three collections, which are now for sale on this website. I think they really ARE fabulous folksongs every girl should know! 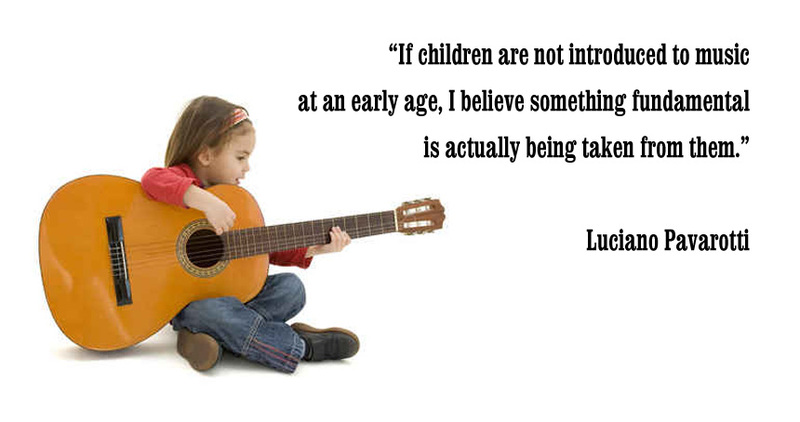 Simply stated, my mission is simply to help other women and girls learn to play guitar and sing for fun. I could bake y’all cookies instead, but I think music makes a much sweeter gift. 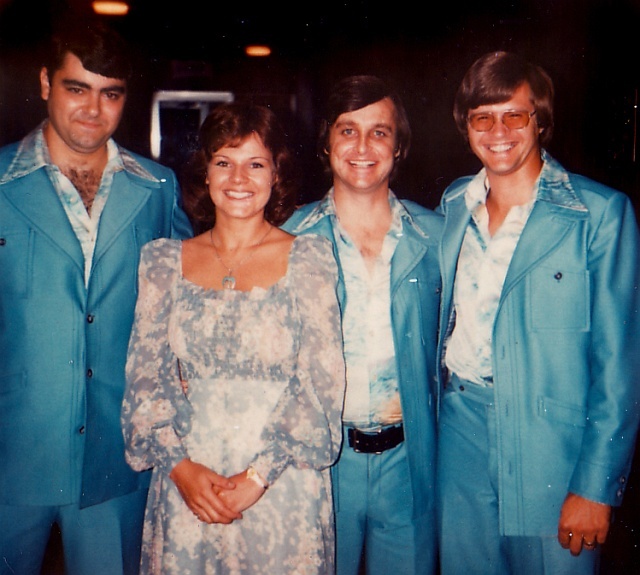 Band shot from 1974: Jerome, Karl, Mike and me. 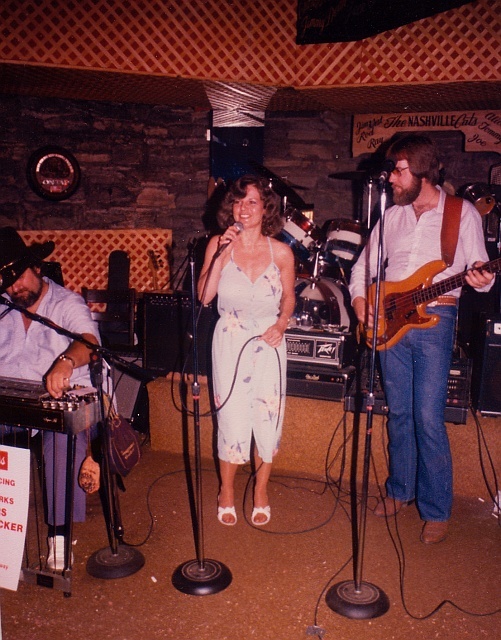 The Stockyard sometime in the 80’s. Me and my mom, in the late 80’s. 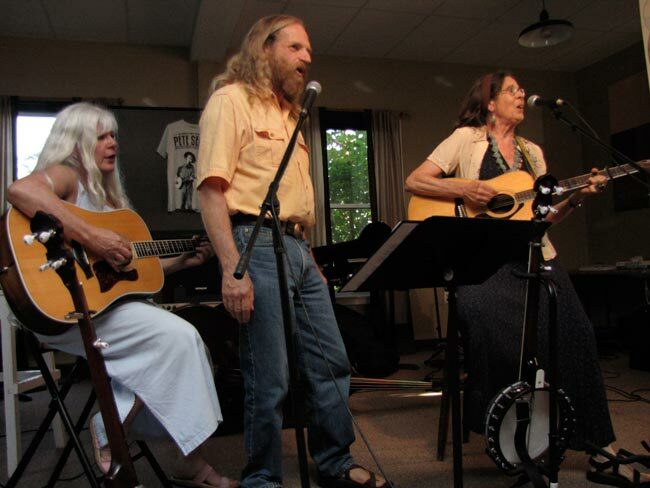 I had the good fortune to meet Charlie and Nancy Hartness while teaching at the Alabama Folk School a few years back. They were on the instructor staff and played a variety of instruments, including the ukulele. I had seen an old time band in Alabama that featured a ukulele and I loved the energy and tone, but when I heard Charlie and Nancy perform, my heart was hooked on the uke. They were two of the funniest people I’d ever met and two of the friendliest. We hit it off from the start and I asked them if they would co-author a ukulele version of my songbooks, and I’m so grateful they said yes. If I was to learn the uke, I needed practice material. So together, the three of us dug through the guitar songbooks and came up with 40 we thought would be good tunes to learn on the uke as well as one the guitar, songs that featured open uke chords. They showed me the chords and I created diagrams; we all worked on the educational content. And Charlie proved himself to be an excellent proofreader. 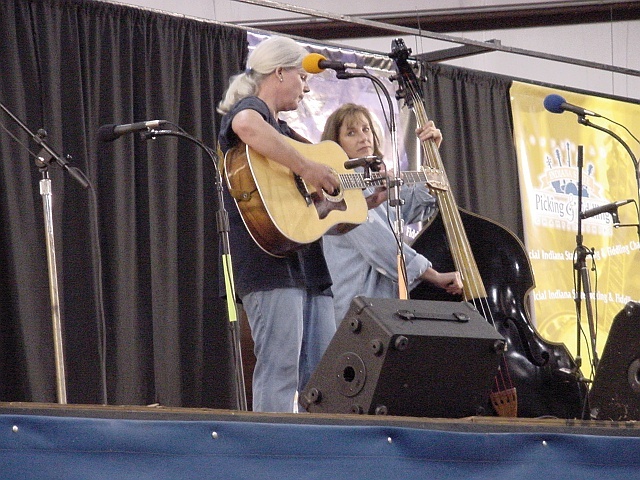 The Hartnesses met playing music at the Festival of American Fiddle Tunes in Port Townsend, Washington, in 1996. They’ve lived in the Athens of Georgia since 2006, where they write tunes, songs, poetry and prose. 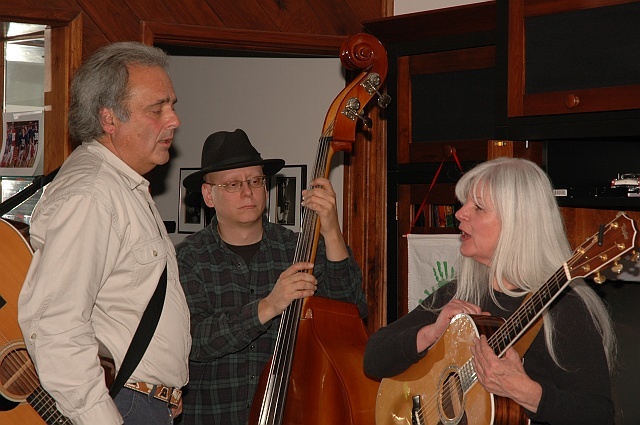 They perform as the duo Hawk Proof Rooster, and have appeared and recorded with the Sky Island Stringband (with Jimmy Triplett and Candy Goldman) and the Skeleton Keys (Howard Raines, Trisha Spencer, Brendan Doyle, Virginia Musser, Emily Mann). They also teach fiddle, clawhammer banjo, guitar and ukulele at old-time music camps. Charlie is originally from Macon, Georgia, and Nancy is from Seattle. Please visit them at hawkproofrooster.com for more information. All book sales are considered final but if you are unhappy with your purchase, we will consider issuing a full or partial refund. In case of shipping damage, please contact us via email. We will be happy to provide you with a replacement. All material in the Fabulous Folksongs Every Girl Should Know series has been carefully researched for authenticity and origin, with each research step dutifully archived in case of challenge. We believe that every song in our collection is indeed from the Public Domain, but if you can legitimately claim a copyright on any song or arrangement in our collection, we will be happy to remove your song from our website and future publications immediately upon receipt of documentation of ownership. We may not be held liable for any refund or rebate for errors in our lyrics, text, chord diagrams or music education materials. Mistakes exist in our books and methods, no doubt. You may also have another opinion on the lyrics and melodies presented here. Carry a pencil and expect to personalize your songbooks.